Here’s a shirt that is bound to make you happier if you wear it! It will put a smile on a lot of others’ faces too. 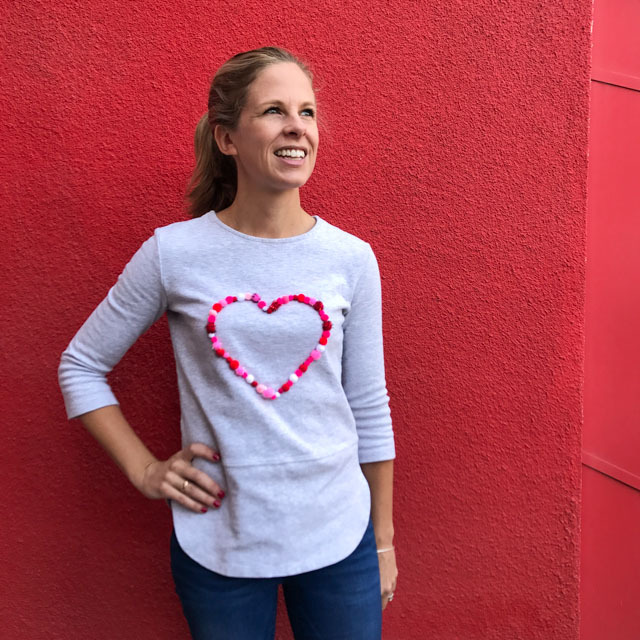 😉 This DIY pom-pom sweatshirt is fun way to jazz up an old shirt or sweatshirt for Valentine’s Day in under 15 minutes with no sewing required. 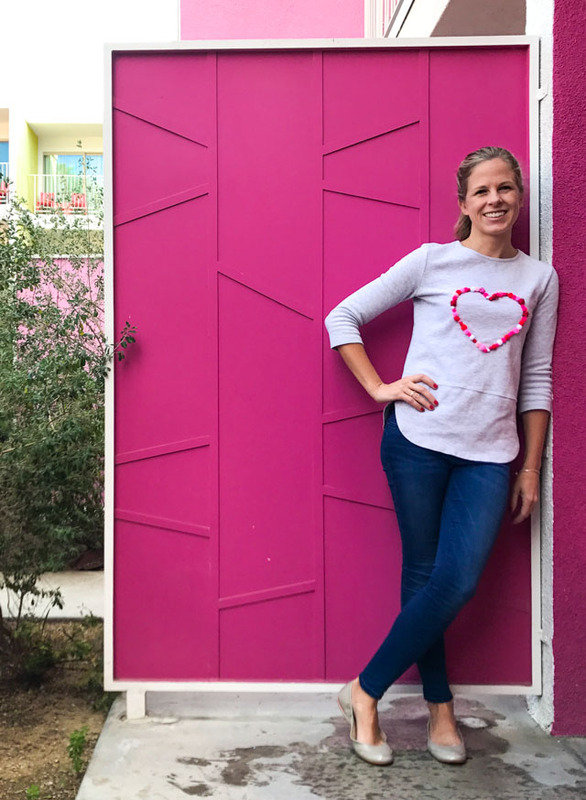 I sported my pom-pom sweatshirt at my last day at the Alt Summit blogging conference in Palm Springs. The colorful Saguaro Hotel made for the perfect photo shoot backdrop. A shoutout to my friend Jeran of Oleander and Palm blog for snapping these pics! 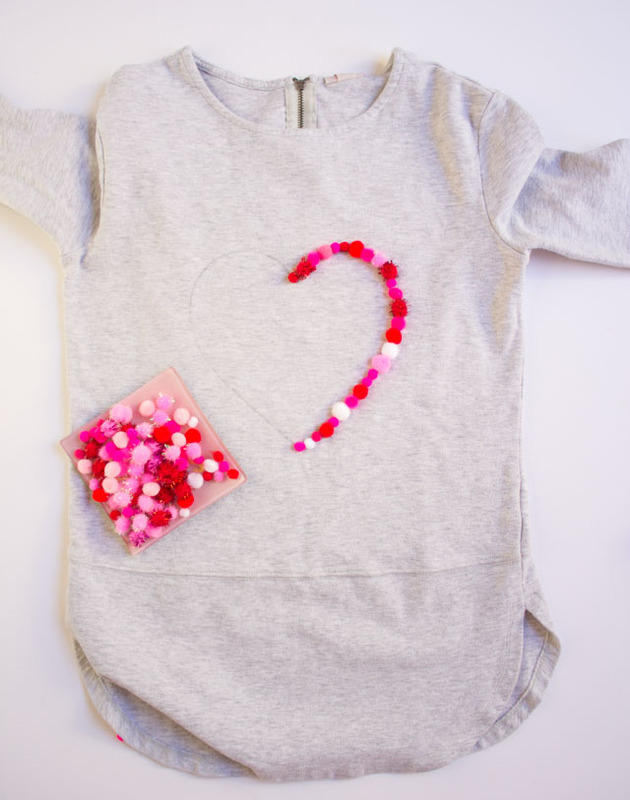 Check out this video to see how you can make this shirt in just 15 MINUTES! 1. 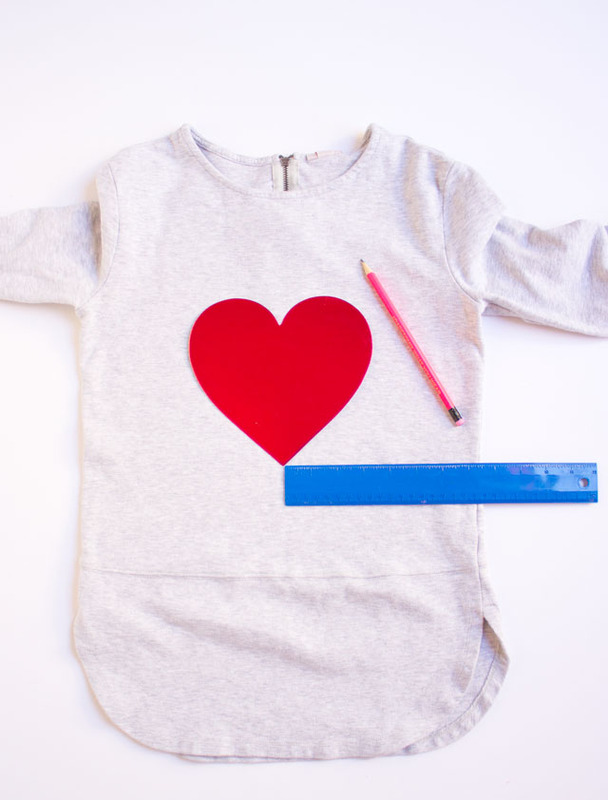 Lay your shirt flat and then center your heart template in the middle of the shirt. Use a ruler or measuring tape to help make sure it is centered. Hold the template in place (you can add a little masking tape on the back) and trace around the template with a pencil. 2. Slide a protective piece of cardboard or plastic between the front and back of the shirt to prevent the fabric glue from seeping through to the other side. 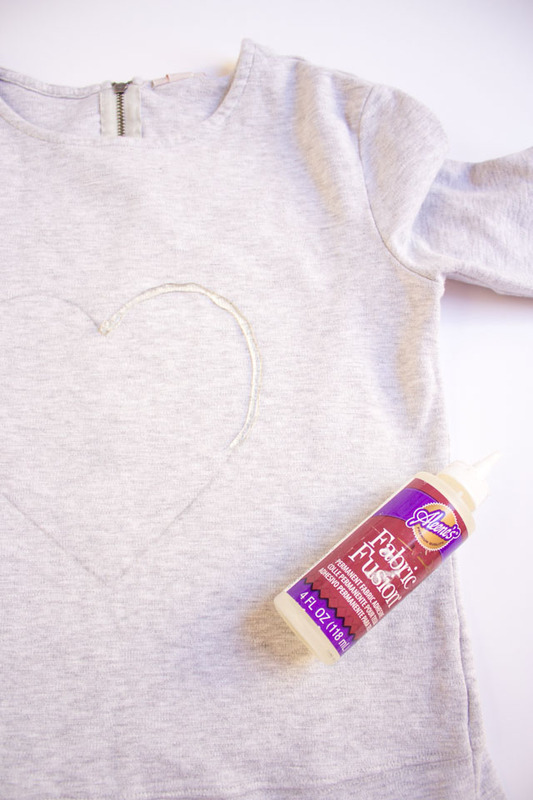 Add a generous bead of fabric glue around the heart outline, working on a small section at a time. 3. Press the pom-poms into the glue and work your way around the heart. Let dry completely overnight! If you want, you can also use a needle and thread to sew the pom-poms to the shirt for added hold. Note: I have not yet attempted to wash this in the washing machine! While the fabric glue will hold the pom-poms, they are delicate and may deteriorate and lose their fluffiness in the washing machine. I will update this once I find out! In the meantime, I say hand wash or dry clean is best. The perfect shirt to show off my love for crafting and all things pom-pom! Love pom-poms too? Then don’t miss my pom-pom balloons, monogram art, shadow boxes, and mouse pad!